Straight from the cover of Black Belt magazine! Kombat Arts and Trinity Martial Arts are proud to present a seminar with Professor Salem Assli of the Inosanto Academy. 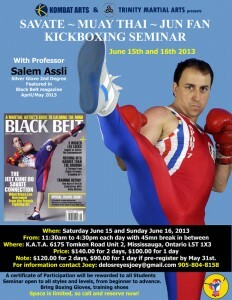 This seminar will focus on kickboxing, drawing from Savate, Muay Thai, and Jun Fan Gung Fu. Details of the 2 day seminar can be found on the flyer above.